Virtually all thermal insulation whether it is installed in exterior walls or in the attic should have a vapour barrier. The barrier is ALWAYS installed on the heated side of the wall or ceiling. This is to prevent moist air from getting into the wall cavity where it will condense and may promote mold and mildew growth. As explained above the vapour barrier is installed on the heated (interior) side of the wall. An air barrier is installed on the exterior side of the wall, right behind the cladding or masonry. Both, vapour and air barriers, are installed to maximize the R-Value properties of the insulation. Loose-Fill Insulation Overview. Insulation contractors. Loose-fill insulation is made from a variety of materials, with textures ranging from granular to fluffy. Loose-fill insulation is excellent for filling irregular or inaccessible spaces. It is suitable for walls and floors and excellent in attics and enclosed spaces such as roofs where the space between the joists may be irregular or cluttered with obstacles. It is often handy for filling small spaces or covering ceiling joists. It is not appropriate for below-grade application. 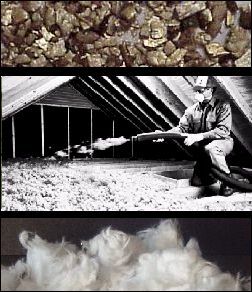 Loose-fill insulation may be blown or poured. Blown-in insulation is usually more fluffy and may require less material than when poured. It is useful for topping up existing insulation in attics and accessible enclosed wall cavities and for filling in cracks and uneven spaces. It is ideal for hard to reach places where it would be difficult or impossible to install other types of insulations. The proper installation of blown loose-fill insulation usually requires the expertise of an insulation contractor. To achieve the full R-value per inch (or RSI value in metric terms), the material must be installed following the manufacturer's instructions. The most common types of materials used for loose-fill insulation include Cellulose, Fiberglass and Mineral (rock or slag) wool. All of these materials are produced using recycled waste materials. Cellulose is primarily made from recycled newsprint. Most fiberglass contains 20-30% recycled glass. Mineral wool is usually produced from 75% post-industrial recycled content. There are studies suggesting that fiberglass particles can be linked to respiratory problems and cause (temporarily) skin irritation. More significantly, according to the Canada Mortgage and Housing Corp., there may be a potential cancer risk from exposure to both fiberglass and mineral wool insulation particles. Therefore, when handling any type of insulation always wear long sleeved tops, gloves, eye protection and a face mask. Having the work area well ventilated is also recommended.